Danang is home to three of Vietnam’s best golf courses, top resorts, three World Heritage Sites, and one of the world’s 10 best beaches. 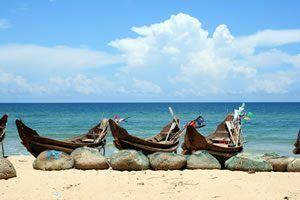 Therefore, it is no surprise then that some refer to this area as the Golf Coast Vietnam. Danang (or Da Nang) itself dates to the early 14th century when the area was settled as a small village in central Vietnam. In 1954 with the division of Vietnam into the North and South, Danang became part of South Vietnam, and in 1965 was the location of the first landing of US forces in Vietnam when it was aptly coined “China Beach”. At the height of the conflict upwards of 100,000 GI’s were stationed in this area. Nowadays, this same area as the Americans used during the bad times is home to one of Asia’s best beaches, many first class resorts and Vietnam’s three finest golf courses. The three courses are of championship quality, designed by famous course architects, and have been awarded at numerous golf events and shows around the world. 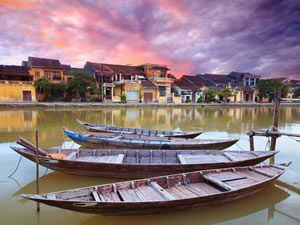 Nearby there are three World Heritage Sites, the closest and most famous of which is the ancient trading port of Hoi An. Hoi An & Danang are connected to each other by modern coastal road. Wandering through old town, golfers are transported back to the 16th century when Hoi An was Vietnam’s most important trading port. With its lovely 500 year old wooden shop-homes, Hoi An offers golfers a glimpse of the real Vietnam. Nowadays, Hoi An mixes old world charm with a modern and vibrant entertainment, dining, and shopping. Located to the North of Danang, Hue was the capital of Vietnam during the feudal rule from 1802 to 1945 under the Nguyen dynasty and subsequently the center of architectural evolution of the era. The World Heritage Sites of the Hue Citadel and Huong River (Perfume River) creates its main attraction. My Son, between the 4th and 13th centuries formed the center of the unique culture which owed its spiritual origins to Indian Hinduism. The series of impressive tower-temples are located in a dramatic site that was the religious and political capital of the Champa Kingdom for most of its existence. An ideal location for golf, relaxation, service, culture, and sightseeing, Danang is the perfect spot for the Accor Vietnam World Masters Golf Championship.